Reynolds still Deadpool, Zombieland writers to provide the wisecracks. | Critical End! I was pretty jazzed when Ryan Reynolds was cast as Green Lantern, but I figured it severely slimmed the chances of his reprising his role from X-Men Origins: Wolverine in a Deadpool solo flick. 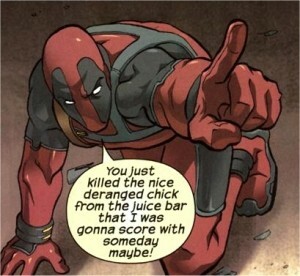 But, apparently, Deadpool is still a go, and the Zombieland guys are writing it. Rhett Reese and Paul Wernick (authors of my second favorite film of the year) have demonstrated an excellent mastery of dry wit and dark comedy, making them a solid choice for a successful adaptation of Deadpool. And this will make Reynolds the first big name I can think of to headline as both a Marvel and DC hero (although, I guess if you count his role in the third Blade movie, he was there already.) All we need is a competent director, maybe somebody willing to let Reynolds improvise here and there, and this thing might turn out alright. This entry was posted on Monday, January 11th, 2010 at 6:00 amand is filed under . You can follow any responses to this entry through the RSS 2.0 feed. Both comments and pings are currently closed.